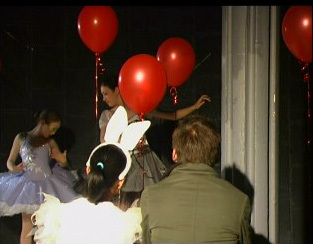 Retro-looking Trains, Ballerinas and Fairy Rabbits. More Production Photos From Girl Disconnected. My skin is currently peeling after the major sunburns I suffered during last Friday's grueling shoot. Thankfully, the subsequent shoots for the production were much easier as we were in a more controlled environment. One in the university's TV studio, and one in the Bassendean Railway Museum. The scene with Justin and Grace (the rabbit) was shot during Mooncake Festival two days ago, while the train scene was shot early yesterday. So here you are, some more production photos from my upcoming short film. In which Justin replaced Chau as the new lead actor of Girl Disconnected. And production photos taken under during a very grueling shoot under a damnably hot temperature.